There has been an increased interest in investing in Bitcoin and other types or cryptocurrencies. Investors in cryptocurrency often have to take steps to ensure that their data is not compromised and their investment stolen in a matter of minutes. The steps the investors take to ensure their investment is safe are also the steps that can make it difficult for their heirs to access the cryptocurrency once the investor dies. Therefore, it is important for investors to consider putting in place an estate plan that covers the special situation presented by cryptocurrency investment. Whether online or offline, access to the cryptocurrency is through a series of private keys or passwords depending on the method used. This means that without the access information it is difficult, if not impossible, for a person’s heirs to access their accounts after his death. If a person who owns cryptocurrency wants to ensure that his heirs have access to these funds, he can leave all access information written down and stored in a safe place. 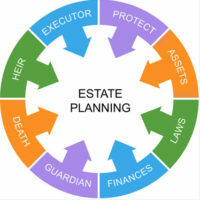 It is also important to consider the tax implications for your heirs. While some people assume that their purchase and ownership of cryptocurrency is anonymous, and therefore, no taxes need to be paid on profits; this assumption is not correct. It is possible to trace the purchase and profit made on cryptocurrency. Currently, the IRS considers cryptocurrency to be property. The sale of the cryptocurrency could trigger capital gains taxes to be paid by a person’s estate or his heirs. This may change the way you plan your estate. If a person decides to put cryptocurrency in a trust for the benefit of his heirs, he should choose someone who has knowledge and expertise in cryptocurrency and its market to serve as trustee. Choosing someone who has little to no knowledge could mean that the person will not be equipped to handle the ups and downs that come with investing in cryptocurrency, and the trust assets could lose value fast. In some cases, if the heirs can track a person’s ownership of cryptocurrency to a particular account on a cryptocurrency exchange, they may be able to gain access to the account and the currency in the account. Because of security concerns, this may not always be possible. It is always better to put a plan in place that gives the heirs direct access instead of hoping they will prevail in convincing the company they should have access to the account. If you would like to learn more about how you can plan to pass on cryptocurrency and other non-traditional property to your heirs, contact a knowledgeable estate planning attorney at Meyer & Spencer, P.C., with offices in Pleasantville and Mahopac, New York, and serving Westchester and Putnam Counties.